Network performance. Service outages. Data security. Cell tower safety. Customer churn. Speed to market. Sustainability. Government regulation. Global competition. The stress on telecom and ICT network operators and suppliers to "do it faster, better, cheaper" is immense, while the cost of poor quality (COPQ) can be financially devastating. How can ICT organizations address these challenges in their own companies and with suppliers? 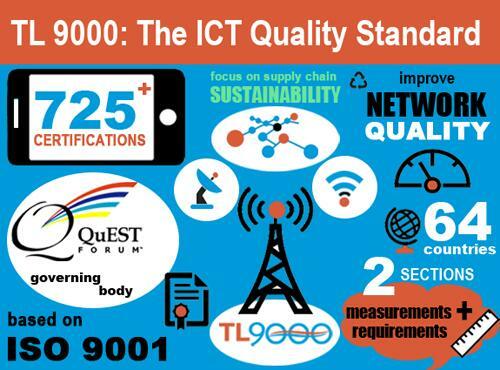 One way is to implement a comprehensive quality management system such as TL 9000: The ICT Quality Standard. Nationally recognized as TL 9000 Experts, BIZPHYX is the nation's leading quality management consultancy, specializing in the implementation of TL 9000, the ISO based quality standard of the telecommunications and ICT industry. Serious about getting certified? We offer a full suite of TL 9000 consulting and training services. BIZPHYX has the distinction of having QuEST Forum Fellows and TL 9000 Experts on staff. We've been involved with the TL 9000 standard since its beginning in 1998, participating in the original work groups that developed the TL 9000 standard. BIZPHYX is led by a team of executives with over 100+ years of combined ICT, telecom and quality management experience. You won't find a more experienced team with knowledge of the TL 9000 standard and the ICT industry. listed on the NQA ACR. BIZPHYX has 40+ years of developing and providing training. BIZPHYX was a global QuEST Forum authorized training provider of TL 9000 sanctioned courses until 2019. As TL 9000 subject matter experts, we produce case studies and educational podcasts on the impact and value of the standard. These resources are located on our knowledge base and on our blog: support.bizphyx.com. Listen to a recent podcast interview with Great Plains Communications, the first Tier III Service Provider in the US to achieve TL 9000 certification. BIZPHYX had the privilege of leading their implementation. Read our case studies and what clients have to say about our performance. "I have been associated with BIZPHYX for the last 10 years and have found them to be very professional and willing to go above the call of duty. Bob has conducted internal audits for the company concurrently for the last eight years and provided excellent consultation for the strengths and weaknesses of our Quality Management System and opportunities for improvement. Without hesitation, I can wholeheartedly endorse them and can personally vouch for their professionalism, business ethics and courteous, customer first attitude."